@WatchingWolf yes. 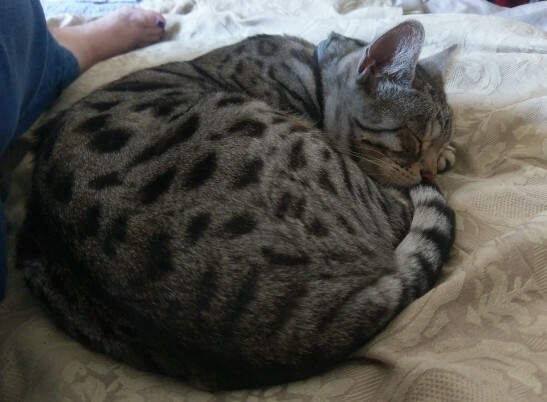 He&apos;s a silver spotted Bengal, and has beautiful markings and a lovely personality. @Andrea Oh cool! Always nice when they have a good personality to go with their good looks! @Andrea This round cat is so inspiring, I just attempted a very rough sketch of it, for an idea that just came to me. It's dove-tailing rather nicely into the #knitting of round shawls moment I'm going through presently. I want to knit a round shawl with the pattern of a sleeping cat hidden in it now! @Andrea That's so kind of you, thank you! First comes the thought, then the plan... that next step might be awhile, though.